Follow the path of rational thought and self-control as a stoical monk!! What is Characters-By-Level - Game Avatars Edition? **Note: With the exception of our virtual tabletop tokens and website avatars, all Characters-By-Level digital files are for offline personal use only. 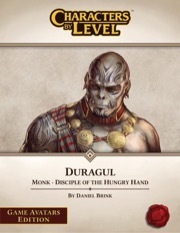 Sign in to start a discussion about Characters-By-Level: Duragul—Game Avatars Edition Download!